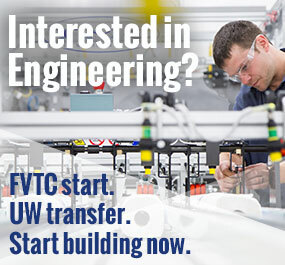 In this growing area of engineering, you’ll get the skills you need for a career as a manufacturing engineer, automation engineer, maintenance technician, electro-mechanical technician, engineering technician, quality engineer or quality analyst. If you’re a good problem solver who enjoys working with your hands, this might be a good career choice for you. You will learn to install, troubleshoot and repair complex machinery for business and industry. You’ll gain knowledge and skills related to electronics, pneumatics, hydraulics, mechanical devices, industrial computers, sensors, instrumentation equipment and automated systems. You’ll also learn to calibrate instruments, write programmable logic controller (PLC) programs, tune closed loop automated systems and design products. Excellent career opportunities await graduates of this degree program.